Every initiative of Vana has risen out of our intent to be of service, each becoming a medium and a unique expression of a different aspect or pillar of Vana. Vanaveda is one of them. Its intent is to enhance wellbeing. It would one day, perhaps in the not so distant future, become an outreach of Vana’s wellness knowledge and experience, making it available for more, in various forms and ways. 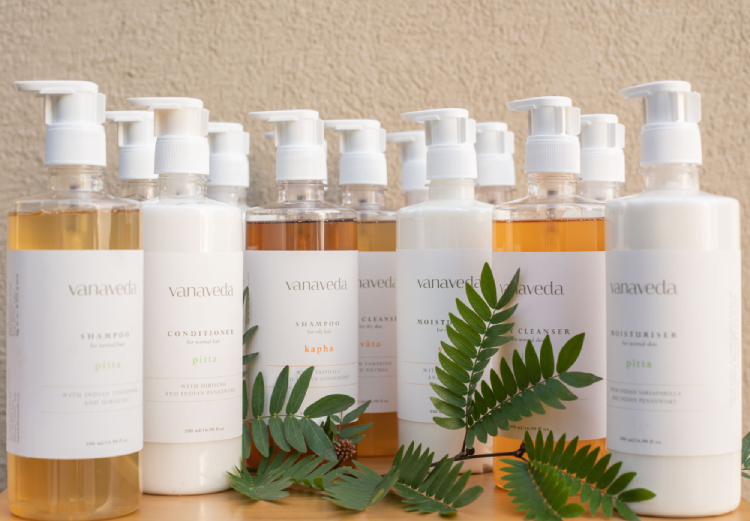 Taking its baby steps during the nascent years of Vana, Vanaveda assembled its first range of Body and Hair products for the retreat’s use, when it opened. That was five years ago. And now on Vana’s fifth birthday, Vanaveda has presented its most significant cohort yet – an array of 21 products. 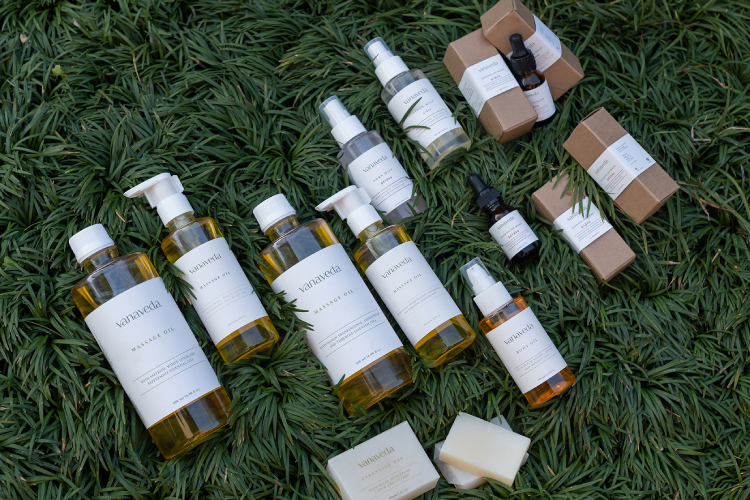 A comprehensive ‘daily care’ range with the vata, pitta and kapha variants of shampoo, conditioner, body cleanser and moisturiser, a hand wash, cleansing bar and an all-purpose top-to-toe oil. There are massage oils in the rejuvenation category and, essential oil blends, linen and aura mists in the calming and comforting category. All of these come in better packaging with refill pack options. We are glad that we have been able to source all our packing material from India this time. 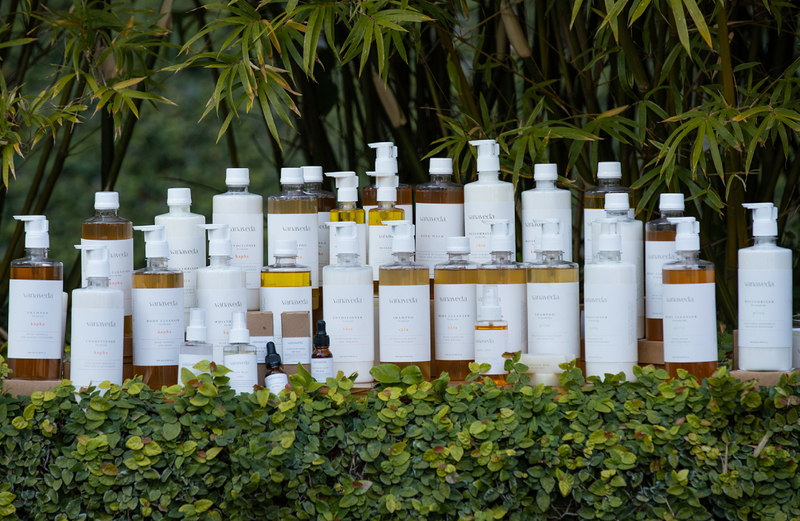 Soon after the last production of the Vanaveda range nearly two years ago, with minor iterations to its 2014 formulae, the team started to focus on improving the composition and efficacy further as well as make them fully plant based, as more and more plant derived ingredients started to become available. Carefully developed with suitable herbs of various potencies for their action on the skin and sometimes even deeper, well calibrated moisture-oil balance, choice of essential oils for their action and aroma, all of them produced in India, plant derived base ingredients and through conscious sourcing, we have strived to keep our promise to wellbeing, environmental consciousness and sustainability. Garnering the expertise and experience of Vana’s wellness team of Ayurveda and Traditional Medicine physicians, Vanaveda’s Research and Development head, a qualified Ayurveda physician himself, has been able to synthesise those inputs into a fresh new set of formulae of Body and Hair products that are now more vata, pitta and kapha oriented in its composition. Through their every stage of development these were carefully evaluated by Vana’s Ayurveda physicians. Though the range’s aromatic appeal is not compromised, you will recognise and appreciate its definite shift towards the therapeutic and functional quotient than its predecessors. However, the manifestation of the five elements, the pancha maha bhutas they represent and the concept of doshas are far more subtle and greater, that are too intricate, subjective and non-linear than we understand them to be. No one can claim to balance the doshas through an external application or a skin care regime alone. There is much more in play. From the geographical location, seasons, age, gender, phase of life, nutrition, post digestive effect, environment, sensory inputs, social relationships, occupation, activity, lifestyle, emotions and thoughts to our own inherent and unique nature or identity. Yet, even beginning to recognise and taking small steps in different spheres of our lives, from a place of awareness and understanding of the bigger picture, can make a significant difference to our wellbeing. In essence, it is our hope and wish for these dosha specific products to serve as a reminder and reflection of our uniqueness, our connectedness to nature and the impact of seasons, environment and lifestyle on us, to help make conscious wellbeing choices as we go about our lives. It is Vanaveda’s way of paying tribute to the ancient and timeless wisdom wellness traditions that is represented at Vana. We are working on bringing some more products during the first quarter of this year. The rituals range and a subset of it, that are something very special to us and we look forward to sharing them with you soon. These will be useful accessories for personal and group study, practice, meditation, prayers and celebration. There would be a few more products to use around our personal spaces and homes – a new palette of pure essential oils that are produced in India, soy wax candles in new aromas, incense sticks and such. Vanaveda is a sensory slice of Life at Vana. Most of the products are used at the Retreat, contributing to the overall sense of care and wellbeing. We hope you will enjoy using them at Vana and benefit from taking some of them with you home, as a reminder and supplement to your personal wellbeing, discovery and journey. All of Vanaveda’s products can be found at Dukan in Vana. We look forward to making them available soon at a few select retail outlets and hopefully on our online shop too later this year.